Moving can be a hectic time, but with the right planning and preparation, you can efficiently get through it without incident. If you’re hiring a moving company, but you want to save money by packing up your own household for the move, then leave yourself plenty of time to pack right. Whether you’re moving into or out of Las Vegas, using the right moving and storage boxes for each item will help make sure everything arrives safely, and it can save you time and money on your move. 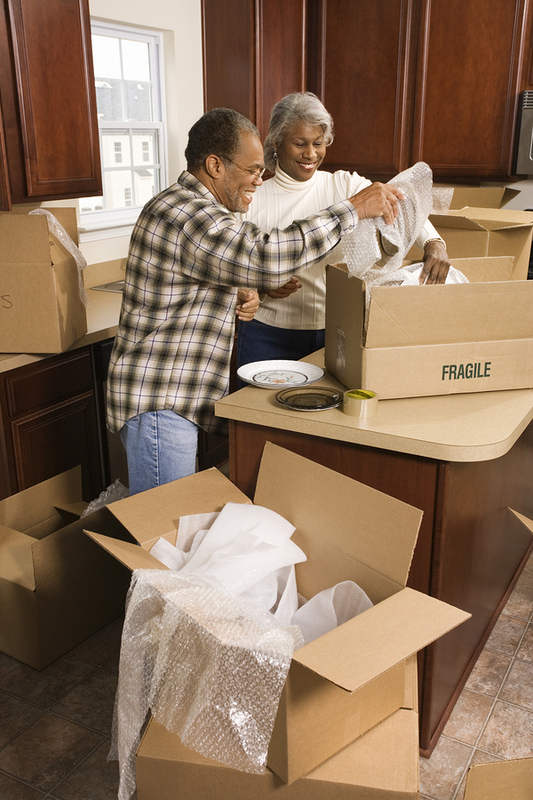 Begin stocking up on a variety of moving boxes and packing supplies right away. Having everything at your fingertips when you begin to pack will make things easier and make sure your packing is efficient and organized. Your first task is getting sturdy boxes of the right sizes to hold various items. You can find free moving boxes in a number of places, like retail stores, or on craigslist.com or www.freecycle.org, though usually you won’t find everything you need to do the job right going that route. We recommend you use a variety of new or lightly used boxes. Flimsy, used or damaged boxes are prone to tearing and bending when handled and being crushed under the weight of other boxes or items stacked on top of them. Professional mover grade boxes are the best way to ensure smooth transport, especially during loading and unloading so your things are undamaged. While high-quality, corrugated moving boxes cost a bit more, it’s money well-spent to protect your important items. Your Las Vegas moving company can provide boxes of any size that you need to take care of your items. Check with your mover for prices, free boxes and discounts on moving supplies and packing. Some people use dish towels, newspaper, paper plates or other soft, cushioning items to separate dishes and breakables. As long as the material properly cushions the item from other items as well as from the sides of the box which might get bumped, go for it. Start early and save packing popcorn, bubble wrap, or those inflated air cushion strips from your Amazon or other shipments you receive. Those can come in handy for use during your move. When packing for a move, you may be surprised at the amount of clutter you’ve accumulated while living in your current residence. Before you try to pack up stuff you really no longer want or need, declutter first. Do you still have boxes unpacked from your last move? Unless it’s heirlooms, you probably can get rid of that stuff. Don’t just sift through the boxes, look at every item and decide if you’re ever going to use it or it has sentimental value. Chances are, if it’s still packed away, you can get rid of it. The same is true of storage areas, like attics, closets and garages. If something is collecting dust, don’t bother packing it up and hauling it along to just sit unused. What Should You Do With Unwanted Stuff before you Move? You can sell some items you don’t want to help recoup moving expenses or donate them to charitable causes. Here are some places for selling used items online. Donate usable items you can’t sell to places like Goodwill or the Salvation Army. To keep from adding to local landfills, recycle what you can of the rest, and only throw away things that are broken, expired, unsaleable or unwanted by anyone else. For large recyclable items or those with hazardous components, local haulers may take things like old TV’s and appliances for a small fee, or ask your mover if they can dispose of them for you. Packing your belongings safely helps your move go smoothly and without breakage caused by poorly packed items. Before you start packing, select a box that’s appropriate for the items that will go in it. For example, if it’s your bookshelf, keep the box fairly small as books are very heavy. However, if it’s your linen closet, go for big, deep and wide. This way you can fit thick items easily and pack sheets, blankets and towels together. They’re light and not breakable, so a big box is fine. Medium boxes are best for kitchen items which are bulky but delicate and fairly heavy. You get the idea. When you get to the kitchen, glass collectibles or other delicate items, it helps to plan a strategy ahead. The more care you take to secure your breakables, the less likely damages occur during transit. If it’s breakable, wrap it up with either paper or bubble wrap. Always use plenty of packing material and tape it closed after wrapping. Place a couple of inches of crushed paper in the bottom of each box to help cushion contents. Pay attention to the size and weight of items going into the box. Layer items within each moving box. Put the heaviest items on the bottom, then layer in descending weight order with the lightest layer on the top. For added padding, fill any empty spaces between layers with that air cushion packing material or more crushed paper, and finish with more packing material on top. Pack similar items together, since similar sized items have less chance of damaging each other. Make sure any sharp points or edges are covered, so they won’t poke through the box. If a box won’t close properly or you can hear contents rattle when you shake the box, repack the box and add more insulation. Securely tape it closed and label appropriately. Rule of thumb: try to keep each box at a manageable 50 pounds in weight or less. You shouldn’t pack irreplaceable photos, financial and legal documents and medical/family history records with regular household items. Instead, transport these items personally to ensure they aren’t misplaced. Hazardous materials considered flammable, corrosive or explosive are illegal for transport and are not allowed. These items include common items like nail polish and remover, so refer to this list while packing. Larger items, like appliances and furniture, obviously won’t fit in a box, but may need to special handling, such as being uninstalled or disassembled before the move. And, there are those truly difficult items: large pieces of art, pianos, pool tables and gym equipment are examples of items that may need special handling by professionals so they are not damaged by mistake during the move. As part of your move, your Las Vegas moving company will crate, wrap and pad for safe transportation any household goods not going in boxes. At Move 4 Less, we handle items like large TV screens, pianos and pool tables all the time and take great care to make sure they are properly taken care of. Let your Las Vegas moving professionals disassemble or crate these kind of items for you. If you do have to do them yourself, make sure you refer to the owner’s manual, if there is one, on how to move a specialty item safely. Labeling is a vital part of the packing process. Without labels, movers have no idea where to put each box upon delivery, and you can’t easily find things you need when you get to the new destination. Make sure the mover knows the box is yours, just in case your items are combined with another family’s, such as for a long-distance interstate move. Using a marker, clearly write your last name and the room the box should go to on the top and side. As you finish packing each box, briefly list the contents on the side of the box, number it and record in your notebook. If contents are fragile, make this note on the outside of the box, as well, so the movers can be sure to see it. You can use labels or write directly on the boxes. While packing your household yourself takes time and energy to do it right, it helps you save money on your move when using a moving company. Be sure you have everything properly packed and ready to go when the movers arrive. If you have a professional mover, or if you just want to make it easier on move day for friends and family helping out, move the boxes downstairs as you finish them, and place them somewhere near the front door. Often, if your professional movers save time, you can save money. Check with your mover ahead of move day to decide what tasks you will do and what they will handle, and to find out their requirements for what you prepare so everything is well-coordinated on move day. The final box to go on the truck should contain essentials you’ll need immediately after the move, like toiletries, change of clothes, basic kitchen items, etc. Label it clearly so you can identify it fast. Sometimes, packing for a move can seem overwhelming. If you decide you really aren’t into all that packing, and especially if you have a lot of large, difficult items, let your Las Vegas movers handle the packing for you. Plan ahead and call at least several weeks before your move to get everything arranged and let your moving company do the work for you.